The film stars Clint Eastwood as an aging baseball scout with a failing eye sight who takes his daughter (Amy Adams) with him on a trip to check out a hot prospect. In "Trouble With The Curve," Gus Lobel (Eastwood) is an aging baseball scout for the major league team, the Atlanta Braves. Long since widowed and living alone, Gus has embarked on a recruiting trip—maybe his last, considering his age and the changing business—to find a talented young player. He’s joined by his daughter Mickey, a busy corporate lawyer. The two have maintained a mostly episodic and often strained relationship in the past, which secrets and lies have not helped to mend. As they reconnect and attempt to work out their personal issues, they cross paths and fates with Johnny (Justin Timberlake), an upcoming rival scout, in a season that will be deeply cathartic for all of them. 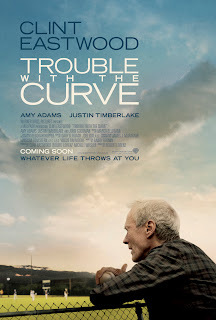 Opening across the Philippines this September, “Trouble With The Curve” is distributed in the Philippines by Warner Bros. Pictures, a Warner Bros. Entertainment Company.